Color correction – or color grading – has taken on more importance these days, with new tools like Apple Color and digital cinematography cameras like the RED One. It is both the objective task of matching shots and evening out differences between them – and the subjective task of creating an artful “look”. Some facilities have dubbed their rooms as “color perfection suites” – and rightfully so. I am going to revisit the topic of color grading inside Final Cut Pro. Although Color is a great tool, it’s not right in all situations and can be very challenging on many machines. Quite frankly, an awful lot of color grading is done right inside the NLE timeline. I am writing this from the point-of-view of Final Cut, but the processes can be utilized with any editing or compositing tool that can apply a stack of filters to each clip. My comments are valid for such apps as Premiere Pro, After Effects, EDIUS and others. This even applies to Avid Media Composer, although that has a very healthy color correction mode, so I’m not sure why you’d want to; except in the case of special looks requiring other filters. Many inexperienced editors think that all you need for good color grading is a copy of Red Giant Software’s Magic Bullet Looks. Apply a preset effect and bingo, you’re done. Of course, it’s never that easy and quite frankly they are, in effect, looking for a “magic bullet” solution. Now, I do like Looks, but there’s no reason you can’t do great work without it and that’s what this post is about. FCP comes with many useful built-in effects filters located in the Color Correction, Image Control and Stylize filter palette branches. Plus, you have timeline Composite (“blend”) modes that can also be used to affect the look of a clip. There are plenty of filters you can purchase or pick up for free to augment the included tools. Just check out the Ecosystem page for links. A while back I wrote about using Looks with RED footage and I linked to this ShootWithRed blog post. For this article, I decided to snag the same image. The starting point is a very flat looking image of an actress shot with a RED One camera. Flat images are great for color grading because you can push the image pretty far for drastically different looks. 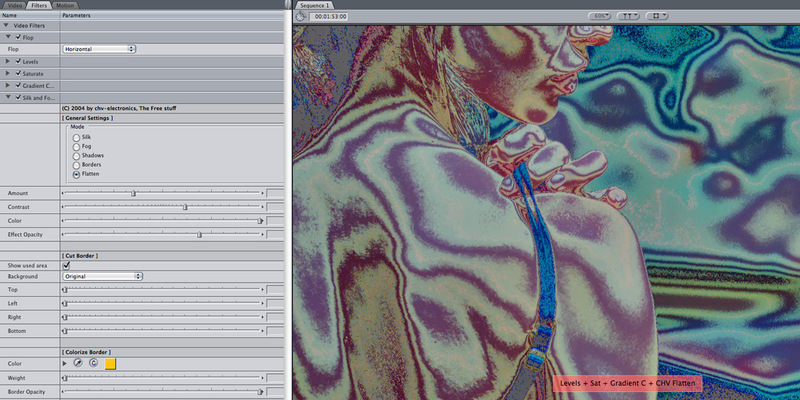 For the sake of composing my frame grabs, I’ve flopped the image to bring the woman and the filter tab closer together. So all of these examples have a horizontal “flop” at the top of the stack. FCP uses a top-down order, so the first filter applied will be at the top of the list and the last will be at the bottom. In many cases, changing the filter order will change your color grading results. On this image, I have applied the basic FCP 3-way Color Corrector for a pleasing image and relatively standard grade. The first step in color grading is usually adjusting brightness and contrast levels. Changing the luminance curve is a way to make an image more “filmic”. CoreMelt makes some nice filters in their Pigment package, complete with a custom UI and “heads up” curves display. This is the same image as above, but with Magic Bullet Colorista applied after the CoreMelt filter. I’ve used Colorista to change the overall exposure and saturation of the image. Now I’m back to the built-in FCP controls from the Image Control tools. Equalize and Saturate let me do much the same as above – adjust tonal and saturation qualities. Joe Maller sells a whole slew of useful effects filters under the Joe’s Filters banner. I’ve added one of Joe’s Soft filters to the previous image for a diffused vignette around the actress. This filter uses blend modes, so this is the look with the filter set to “normal”. The image is the same as above, but with the Soft filter in “multiply”. CHV develops plug-ins to sell, but includes a couple of freebees. Here is Silk and Fog. The key is that it comes with five very different settings: silk, fog, shadows, borders and flatten. In this image, I’ve applied a basic FCP Color Corrector and then the Silk and Fog filter in the Borders setting. CHV Silk and Fog using the Shadows setting. CHV Silk and Fog using the Silk setting. Colorista is a deceptively powerful color grading tool that is available as a plug-in for many different applications. You can use it for masks that work like DaVinci’s Power Windows or secondary vignettes in Apple Color. Colorista can be applied to the whole image, but can also be applied inside or outside of elliptical and rectangular masks. In this next series of images, I’ll build up a look by applying a series of Colorista filters to one clip. This is the first instance of the filter, used to apply a base look to the whole shot. When applying a Colorista mask, using the “red overlay” setting allows you to see the mask as you position it. Now with the correction applied within the mask area. I have used this to increase color saturation on the shoulders and face. Here is a third instance of Colorista, using an inverted mask for the rest of the shot. I have desaturated the area around the woman and shifted it to a more blue tone. Two freebee filters I use a lot are the Haiku plug-ins called Face Light and Vignette. You can do much of the same as you would with Colorista masks. Face Light brightens and/or blurs an area inside of a mask and Vignette will darken an area outside of one. Essentially like “dodge” and “burn” in Photoshop. Here I’m using both on top of the FCP Color Corrector. Bleach Bypass is one of those trendy grading effects. Nattress makes a nice one, but the general principle behind most variations of this effect is to decrease saturation and increase contrast. In a second step, I have applied Nattress’ Temperature to the Bleach Bypass filter. The Temperature filter is shifted to the warmer setting, resulting is a somewhat monochromatic, but reddish tone to the whole image. Color or chromatic glow effects are popular to bloom highlights in an image. In this one, I’ve combined Colorista with Joe’s Color Glow to get the booming effect off of the actress’ shoulder. One new entry to color grading is DVShade, a Noise Industries development partner. Here’s an example of their EasyLooks filter. It is applied as a single plug-in effect, but actually combines within it, many different functions and presets. I mentioned earlier that you can use FCP’s timeline Composite mode for color grading. In this example, I’ve stacked two of the same image onto V1 and V2. The top clip is set to “overlay”. FCP’s Color Corrector is applied on V1 and adjusted to taste, while an FCP Glow filter is applied to the clip on V2. The result is more contrast with glowing highlights on the actress. These next two images use another blend mode effect. This is the V1 clip with a Color Corrector and Prism effect. Now I have edited the same clip onto V2 and applied the Color Corrector filter and made adjustments to taste. The V2 clip is in “overlay”, which lets some of the normal image show back through. The result is that the fringing of the Prism filter becomes more subtle. Compound Blur is another useful built-in FCP filter. When used at a very light setting, it adds image diffusion and can be used to soften rough skin complexion. This next set of images utilizes three built-in filters: Levels, Saturate and Gradient Colorize. The last one is a bit wacky and I’ve honestly never used it; however, it does seem that you can get some very cool looks with it. Same as above, but with the addition of the CHV Silk and Fog filter in the Flatten setting. The acid trip’s over! Now we are back to a “standard” look. This image combines Colorista and the FCP 3-way. I’ve used Colorista for the base grade. Next, I’ve applied the 3-way, but turned on the limit controls. In doing so, I’ve isolated the general range of her skin tones. This creates a mask (which I have inverted), used to control the application of the 3-way. In this case, to darken and desaturate the rest of the image – i.e. the luma/sat/hue range outside of her skin tones. This is another example of a lot of tweaking to “relight” an image. I’ve used several instances of Colorista to grade the image and enhance certain masked areas. For example, to change the grade on her face, back and the background area to the right. Lastly, I’ve added film grain using the Magic Bullet Looks MisFire filter. This is a combination of the built-in HSV Adjust filter and CoreMelt’s Filmic Look. This image stacks a series of Joe’s Filters: Levels, Saturate and Soft Gradients. The latter is used to diffuse the right hand side of the frame. This creates a bit of the “swing-and-tilt” lens look. My final image combines two layers for a composite. The V2 clip is in the “additive” blend mode. The clip on V1 has a Light Rays effect, while the blend with V2 makes the effect more subtle. Both have FCP Color Correctors applied to them, which are adjusted to taste. This entry was posted in color grading, tips and tricks and tagged After Effects, Apple Color, Avid, color grading, editing, Final Cut, Final Cut Pro and Studio, Final Cut Studio, Magic Bullet, plug-ins, workflows.